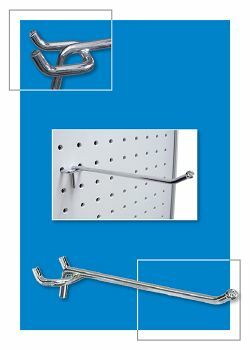 Metal Pegboard Hooks | Product Merchandising | Clip Strip Corp. 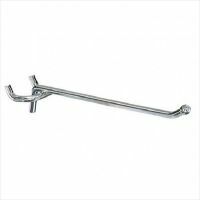 In Standard Hooks: We carry 4", 6", 8", 10" and 12" long versions, they come in sturdy 3/16" thick (7 gauge). These display hooks are for heavy duty usage. Use on all standard pegboard retail display fixtures. They have "ball ends" for consumer safety and can be used with varying styles of holes built into packaging or on hang tabs. Waterfall Displays for Pegboard: We carry two versions - J Hook and Ball/Cube mounting. They are used for taking clothing displayed on hangers and either placing them on the j-hook or ball style waterfall mount. These product merchandising systems are very popular giving customers easier access to the product or information on tags inside the product. Clip Strip Corp. is a leader in point of purchase in-store merchandising components such as accessories for standard pegboard displays like wire metal display hooks. Our products are A+ rated in quality and performance giving you what is expected when you conduct business trusting in us. Our customer service department is very excited to communicate with our customers, give us a call Toll Free at 1-800-425-4778 and we will be glad to help you with any questions you may have. Minimum quantity for "4" Peg Board Hooks - Metal, 3/16" Thick, PBH-M-4" is 100. Minimum quantity for "6" Peg Board Hooks - Metal, 3/16" Thick, PBH-M-6" is 100. Minimum quantity for "8" Peg Board Hooks - Metal, 3/16" Thick, PBH-M-8" is 100. Minimum quantity for "10" Peg Board Hooks - Metal, 3/16" Thick, PBH-M-10" is 100. Minimum quantity for "12" Peg Board Hooks - Metal, 3/16" Thick, PBH-M-12" is 100. 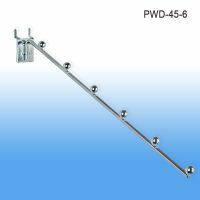 Minimum quantity for "Pegboard Waterfall Display - Metal, with 6 Ball Mounting Stations, PWD-45-6" is 48. 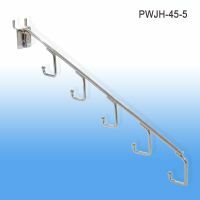 Minimum quantity for "Pegboard Waterfall Display - Metal, with 5 J-Hook Mounting Stations, PWJH-45-5" is 48.